A hard drive enclosure is designed to make the internal hard drive become external by closing it with a case. It gives many benefits like giving traditional internal hard drive portability. It is easier to transfer data to the external hard drive on most computers. With the use of the external hard drive, it reduces the probability of losing data and data corruption. If you want to avoid adding some space to your primary storage, you can use the external storage to back up some files. If you are looking for the best hard drive enclosure in the market, you are in the right place. This USB3.0 to SATA III 2.5″ hard drive enclosure from ORICO support most of the 7mm and 9.mm 2.5″ SATA I, II, III HDD, and SSD up to 2TB. 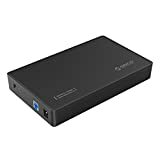 It has an ultra-fast USB 3.0 with a maximum data transfer rate of up to 5Gps, it is 20% faster compared to the traditional USB 3.0 that has UASP transfer protocol. With full advanced features, and very easy to use. This hard drive enclosure does not need a tool for installation, all you need is to plug and play it. There is an LED indicator, and this case is compatible with Mac brushed design, Linux, and Windows. It is made of high-grade ABS material, metal-like casing, and shock pad. It is a perfect addition to your stuff. Another entry from ORICO, this one is a 2.5″ that fits most of 7mm and 9.5mm SATA I, II, II HDD SSD and can support up to a 2TB maximum. The USB 3.0 gives a maximum data transfer rate of up to 5Gbps and it is 20% faster than the traditional one, It also has a UASP transfer protocol. For installation, you do not need installation tool, all you have to do is plug and you are ready to play it. An LED indicator is also one of its features, and compatible with most of the OS like Mac, Windows, and Linux. The transparent design helps you to distinguish which hard drive is inside; this is to avoid using the wrong one. Enjoy having backup storage for your files with UGREEN USB 3.0 external hard drive enclosure. You can easily connect your hard drive to a PC, laptop, and other devices for your data transfers. The use of this enclosure is to protect your hard disk from scratches, and any damages, this also makes SATA HDD portable for any data storage. The HDD case supports OS Linux, Windows, and Mac. 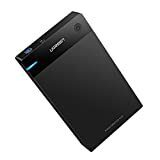 It is designed for 2.5″ SSD and HDD up to 10TB and has a thickness of 7mm and 9.5mm that includes Seagate, Samsung, Western Digital HDD or SSD with a SATA port. The ultra-speed UASP is 70% faster than the usual USB 3.0 and it supports a rate of up to 5Gbps. Just ensure that after you finish using the HDD, you have to click “safely remove hardware” icon before unplugging it to avoid data loss. A blue LED indicator is for the power status, and there is attached soft EVA foam inside to protect your HDD from improper shaking. Protect your backup files with this external hard drive enclosure from Blazedrive. The enclosure is a USB 3.0 waterproof and shockproof case to keep your external hard drive safe all the time. There is an integrated USB 3.0 cable attached, and that you can never forget to take the cable. It supports UASP protocol faster than the others with a speed reach of 5.2Gbps for faster transfer rates. Very easy to install, no need for any tools, and you can get an instant connection when you plug to the PC. There is a USB A-C converter accessory to work with PC, and OTG type C mobile to use for your mobile devices. The rugged design is perfect for people who want something tough and sturdy. ORICO has another entry for our best hard drive enclosures 2019. This hard drive enclosure supports most of the 3.5″ SATA I/II/III SSD or HDD up to 8TB. The case is compatible with Mac, Windows, Linux and UNIX operating systems that supports UASP. You do not need to reboot because the USB 3.0 connection allows a data transfer rate of up to 5Gbps. The hard drive enclosure case is made of ABS plastic and metal. The data transfer port has SATA III and USB 3.0 and can support a capacity of 8TB. It may look like a simple enclosure, but this one is tough, it has a shockproof sponge at the bottom cap of the enclosure to make it stable and safer. The case is designed for easy installation without using any tool and screws for a smooth inner surface for your external hard drive that protects it from scratches. A self-adhesive sponge secures an optimal fit. Protect your external hard drives, to avoid losing your important files and make it more presentable. This is compatible for OS Windows and Mac. The silver 8TB hard drive enclosure from RSHTECH supports most of the 3.5″ SATA I-III HDD and SSD up to 10TB maximum. 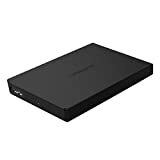 It is compatible with Windows, LINUX, MAC, PS4 series, Xbox 360 and Xbox 1, perfect for keeping your important files and games in one storage. It features an automatic sleep function that enters sleep mode after 10 minutes of inactivity. The power button to turn it on, and with a long press of 3 seconds for it to turns off. 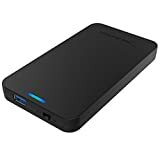 A great case for your HDD and SSD, especially if you are a fan of having a lot of files, and the fact that it is compatible with gaming consoles. The LED light power indicator shows the hard drive activity. It has a 6Gbps rate for data transfers, which is faster than the others are. The aluminum case has vents at the bottom for better cooling, and you can dock the enclosure vertically with the ABS bracket for better cooling performance. 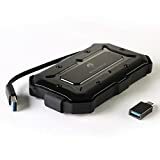 This hard drive enclosure from UGREEN is compatible with 3.5″ and 2.5″ hard drives it connects them to your laptop, desktop, and other devices where you have to transfer massive data and for portable storage as well. It protects your external hard drive from scratches and maximizes its use because your HDD and SSD might have valuable data stored. 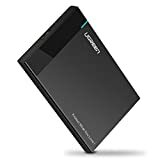 Compatible to most of the operating systems like Linux, Windows, and Mac, but you can also use this as a hard drive to your favorite gaming consoles like PS3, PS4 series, and Xbox series to play more games. It supports UASP 70% faster compared to the usual USB 3.0 allows you to transfer and save files within seconds, it saves you time and allows you to do more. It supports up to 5Gbps rate and backward compatible with USB 1.1 ports and USB 2.0. The case is constructed with high-quality ABS material with solid construction that holds the hard drive firmly, while the soft rubber strip gives anti-shock protection. 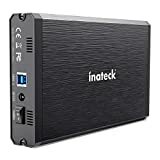 This FE3001 from Inateck has super speed USB 3.0 connections up to 5Gbps maximum. A built-in ASM1153E chipset that supports SATA III that allows up to 6Gbps signal bandwidth for ultra-fast backups. This hard drive enclosure is suitable for Windows, Linux, and Mac and all standard 2.5″ and 3.5″ SATA I-III drives with up to 10TB. Made from a high-grade aluminum alloy material it gives ultra-light portability and features an effective heat vanishing. One for each corner and the internal layer of anti-slip PU leather that protects your external hard drive from scratches four non-slipping rubber pad. The 12V power adapter gives a stable supply of power. Protect your external storage and save time transferring with this hard drive enclosure from Yottamaster. It works great with the standard 7mm and 9.5mm 2.5″ SATA HDD and SSD up to 2TB. The USB 3.0 that can transfer data with the rate of up to 5Gbps, and a UASP protocol that gives 20% faster speed than the others. There is a protective rubber sleeve inside the case to protect your hard drive from scratches and shocks. Hassle free and tool-free installation with an LED light working status indicator. This hard drive enclosure is compatible with Mac, Linux, and Windows OS. The Sabrent EC-UASP hard drive enclosure is one of the best hard drive enclosure 2019. The USB 3.0 quickly transfer files up to 5Gbps. You can connect any 2.5″ SATA II hard drives to your desktop, laptop, and other devices. This case gives extra protection to your external hard drives that you use as backup storage of your important files. There is no installation required, supports 7mm, 9.5mm thickness, and supports UASP SATA III. Suitable for Windows and Mac. 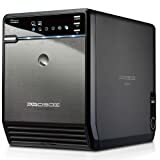 This hybrid hard drive from Mediasonic is our best hard drive enclosure because it can support any types of 3.5″ SATA I-III HDD up to 12TB for each drive not once, not once, but up to 4X. It can support SATA III up to a rate of 6.0Gbps transfer, while the others are up to 5.0 Gbps with the USB 3.0. A synchronization of power on and off with the computer, and supports S.M.A.R.T. To avoid overheating, there a fan with 3 levels of speed and a built-in temperature sensor that controls the fan speed with the auto mode, but you can also use the manual mode of a fan. Having external storage is helpful especially if you have tons of files to save since your internal storage can affect the performance of your device, and also to secure your files and use it as a backup. 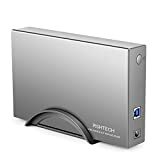 Protecting your external hard drive with hard drive enclosure is important since you store files with this, and you do not want to damage your external hard drive. All these items in our list are the beat hard drive enclosures in the market.